Hotel Leon de Oro is a small friendly boutique hotel in the heart of Miraflores. 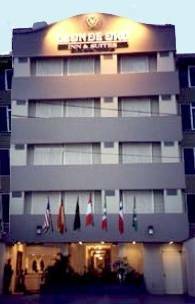 Establishment in 1998 it has been owned and managed by Corporacion Hotelera del Pacifico S. A. a well respected company the in the hotel industry in Peru. We understand the needs and requirements of the our guests from all over the world and aim to provide all the comforts you would expect. We offer comfort, personalized service and value. Our Hotel features a residential environment including intimate living room-like lobby with fireplace and comfortable furniture; guest rooms are designed to look and feel like a guest room in a friend's home. Our operating philosophy is to anticipate, meet and exceed our guests expectations. Complimentary Breakfast Buffet each morning. Daily housekeeping service twice a day with a 6 pm. turndown with Peruvian chocolates. Daily local newspaper delivered to your room upon request. Mineral water delivered to your room upon request. VCR and CD player on request. Peruvian Artist exhibition in our green house restaurant. Each of our elegantly appointed guest rooms are decorated with a highly detailed residential feel that is accentuated with a of Peruvian touch. Room accommodations feature comfortable Queen size beds, and we also offer rooms with two queen size beds. The Jacuzzi suites feature lavish tubs recessed in a corner with their own mood lighting. All accommodations include a 21" remote control color television, free cable TV channels including movies, news, and sports , direct international and local dialing and other thoughtful touches to make your visit more enjoyable. The Hotel is located in Miraflores district with easy acces from Benavidez and Larco Avenue .